...but this can be for you too! ...and also for my Mother-in-law. Even though she's already made her own homemade yogurt. She tried it when she visited back in December and waited as long as she could for my promised blogpost about it before venturing out and doing it herself. But still. It's for her too. See Mom! I'm finally posting it! We went to highschool together, her being a couple grades ahead of me. But her and her sisters and me and my sisters all knew each other and had good times. Those Wilson girls can be counted on for much laughter, I tell ya! Elizabeth's path has led her and her hubby and their baby girl to live and minister in the Czech Republic. There were several years where we lost touch, but leaving your home country has ways of bringing people back together! Prague is now ridiculously high on my travel list and it's all because of Elizabeth. It has a castle! And hot chocolate you eat with a spoon! Its these friends that totally get how you can love love LOVE your home away from home...because they love theirs. And as much as I lament not having certain things here (Oh for a bowl of Lucky Charms!) there are actually things in America that you can't get that are found in other places. Elizabeth is in America right now. She said before she left Prague that one thing she would miss was the thick, fatty, awesome yogurt in the Czech Republic. I have no clue if this will compare, but it'll make a nice close 2nd if it doesn't. So. My dear friend. 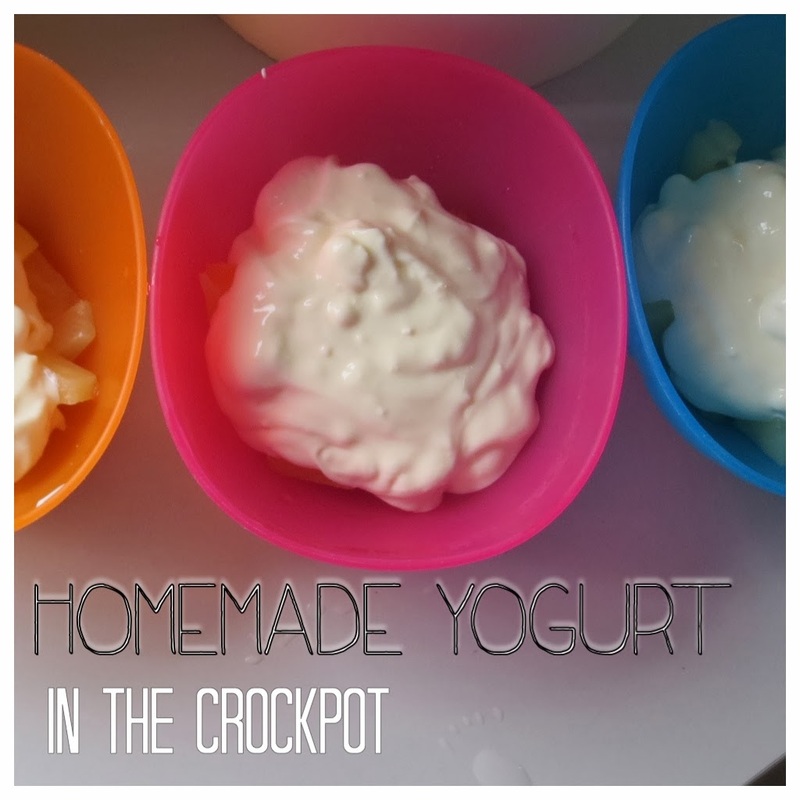 As you enjoy time with the grandparents and miss the Czech Republic all the same, here is a yogurt recipe that I HOPE will do until you get back home. Milk - however much you want. Whole milk works best. In these pictures I used 3 liters...which yields about 2 liters of yogurt. Yogurt Starter with Live Cultures (I usually just get a Plain, individual sized yogurt from the cold section of the grocery store. Just make sure it has live cultures in it) I've observed that when my starter tastes mild (not tart) then the yogurt does too. When it has more of a tangy/tart taste, the yogurt does too. 1. Heat the milk to 180 degrees Fahrenheit. 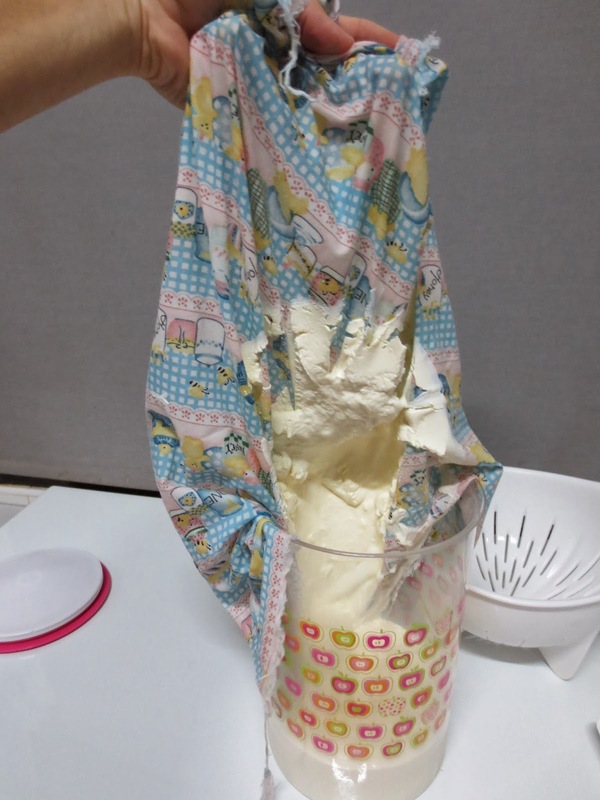 As long as you heat however much milk you're using to 180 degrees, you're good. I do this in a crockpot because I don't have to stand over it on the stovetop. But stovetop works too. Hi or Low setting on the crockpot both work. For 3 liters of milk on High, it usually takes 2 hours for mine. 2. Let milk cool down to between 110-115 degrees. I usually just take the pot out and let it sit on the counter. Maybe a fan on it. Sometimes with lid on, sometimes with lid off. Sometimes stirring to help it along. Some people soak their bowl in an ice bath in the sink to get it down faster. Usually for me it takes about an hour for 3 liters to cool down. I set the timer to remind me to check. 3. Scoop out 2 cups or so of the milk in a separate bowl and add about 2 tablespoons of yogurt starter. Mix well. 2 Tablespoons is what I've found to be a good amount for 3 liters of milk. If you're making less, then less is required. But I've also used up to 1/2 cup. The point of this step is to mix the yogurt starter in well so that it distributes evenly and thoroughly through the milk. Too much and I've heard it "crowds" the milk with too many live cultures, but too little starter and there's not enough cultures to get in there and do the work of spreading and making it all yogurt. 4. Pour into pot and mix well. 5. Cover pot and insulate. People do this step in different ways but they are all intrinsically the same. Some people go ahead and pour the milk+starter into separate containers and insulate. 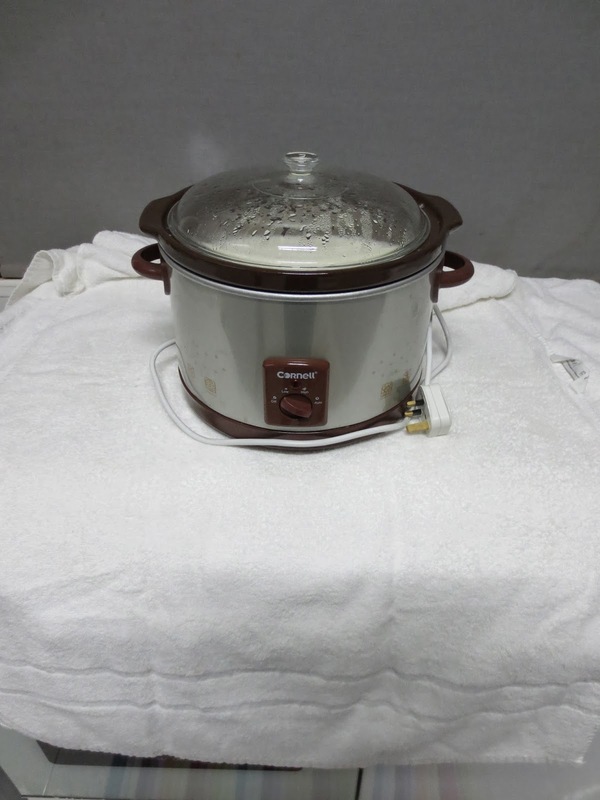 Some leave it in the crockpot but then put hotwater bags or heating pads around it. I have found simply sticking it back in the heater of the crockpot (unplugged!) holds the heat just fine. I insulate mine with 2 bath towels. If its particularly cold where you are, you might want to put the whole thing, towels and all, in your oven (that is off!). My kitchen is year-round warm. Equator being what it is. 6. Let it sit for 12 hours. See how it's nighttime in my picture? That's because I usually let mine sit overnight. And the whole 12 hours thing is a round-about number. But usually that amount is good. Though occasionally when I've checked it in the morning, I think its still too runny, so I wrap it back up and let it sit for a few more hours. 7. Open it up and voila! Yogurt! Don't forget to save some of this batch for the next! Then you don't have to buy starter next time. You can store it and eat it just like it is, or if you are like me and Elizabeth and like your yogurt extra thick, follow these steps. I don't have cheese cloth but apparently it works well. I have some extra fabric with bears and honeypots cut to fit. I layer it over a colander and a mixing bowl... and then pour the yogurt in it. If you have room, stick it in the fridge. A couple times I haven't had the space and the countertop worked just fine. I've left it draining for anywhere from 2 hours to 8hours. The results are about the same. Here's what mine looks like with whey drained out. Also a picture of the yellow whey (and a link to a recipe for pizza crust using leftover whey!) Otherwise you can toss it or pour it out in your garden. 9. Put it in your container! I include these pictures to let you see that this step gets easier with practice. I always have a spatula handy to scrape down the remaining yogurt off the fabric and into the container. Most of the time it just sorta peels off clean and plops down into the container. Below is one way, but we also sometimes flavor it with vanilla and/or honey...add any fruit, oatmeal, or granola or cereal and its total yum! YAY! When I was there you had leftover apple crisp from Thanksgiving dinner and I put some in the yogurt and OMG....best dessert ever (but, I think I had it for breakfast LOL). Thanks for blogging this....you're such a wonderful daughter-in-law! Love ya! This just made my day! THANK YOU!!! Every time I walk past the yogurt section in a grocery I think about how much I would love some GOOD yogurt! :-) I'll have to try this ASAP. Thanks for the step by step directions. I only tried to make it once in Prague, but it didn't turn out as good as yours looks. Will be trying this one day!! Question: do you use fresh, like from the fridge section, milk? Or does shelf UHT milk work too? I know that the levels of pasteurization makes a difference when making ricotta...but what about yogurt?! As far as I know, shelf milk works too. I have friends in Indonesia who most likely can't get fresh, and they make their own. Yes, shelf milk works! We make it from UHT milk regularly, but I've only recently tried this keeping-warm method, since my room-temperature starter finally died. We can't get ready-made yogurt here, but I recently learned you can make it from a probiotics capsule. It's probably a slightly different blend of organisms, but the yogurt is thick and tasty! I used a lot of your ideas from this post, Sharon (though substituting a rice cooker for the crock pot :) ). Thanks so much! !